Large open living room and dining room. 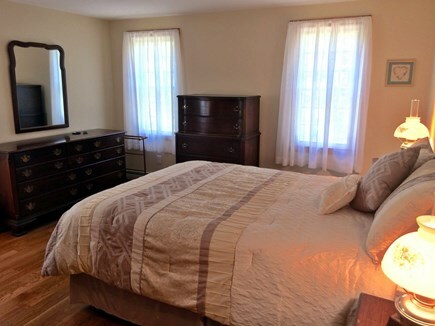 New furniture that includes a comfy L-Z-Boy Queen size sofa bed. 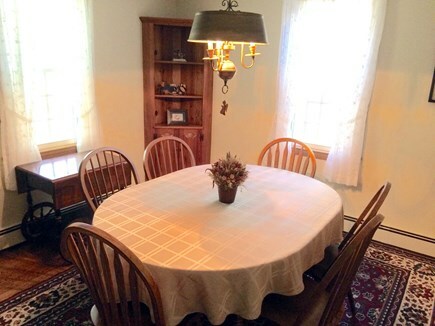 Dining room will easily seat 6 people. Newly remodeled kitchen that overlooks the backyard. Lots of sunshine in the breakfast room with pretty bay window. Baker's Pond is just across the road. 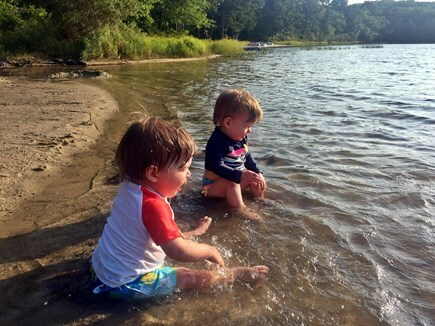 Baker's Pond beach is wonderful fun for the whole family. 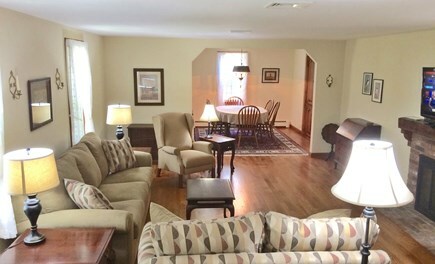 Completely remodeled and looking great! Charming location just across the road from Baker's Pond. 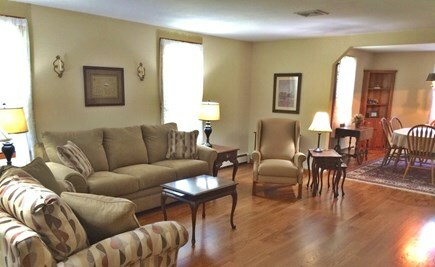 The house is spacious with hardwood floors throughout and central air. The TV in the living room has expanded cable with Voice Activated Netflix access. There's WI-FI, of course. 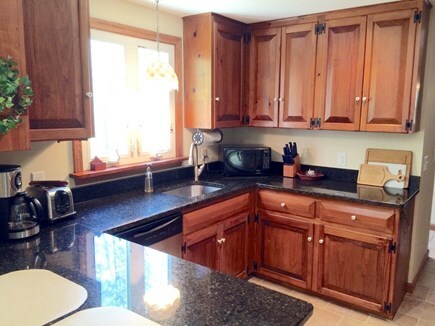 The kitchen has all the extras you'd expect including a dishwasher and lobster pot. 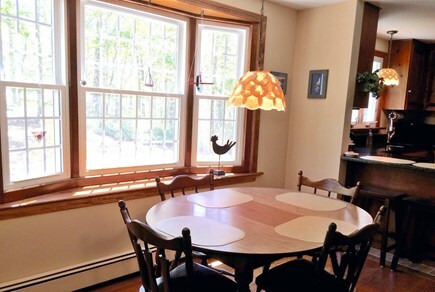 You'll love the openness between the breakfast room and kitchen; there's lots of sunshine from a pretty bay window. 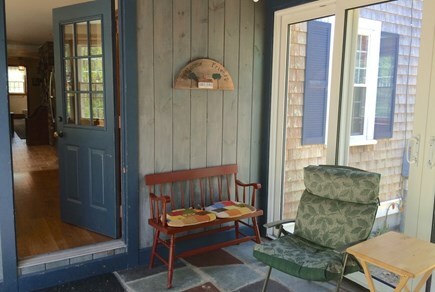 The screened breezeway is a great place to relax. You are also welcome to use the garage and any barbecue and recreation equipment you find. 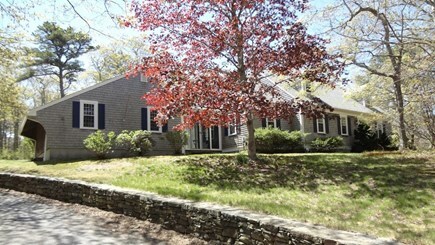 The location is ideal...a short 2-min walk to the tucked-away, sandy beach on Baker's Pond. You can swim, kayak, canoe or fish. This pond is stocked with trout and small-mouthed bass. Explore the 'Ancient Ways'--back roads into Nickerson State Park. Great for a WALKING adventure. It's accessible about 2 blocks up the road. Directions to the 'Ancient Way' are in our guest book. There are big waves at Nauset Beach, a 12-min drive, where you can swim, boogie board or just walk the long expanse of the Cape Cod National Seashore. 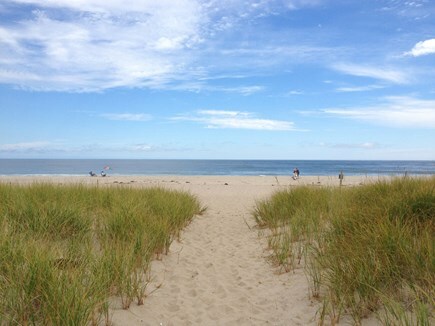 Skaket Beach, on Cape Cod Bay, is only a 8-min drive away. The water is warmer, and at low tide you can walk out for almost a mile. Rock Harbor (free parking) is just a little past Skaket Beach. Rock Harbor is another good spot to walk out ''on the flats'' at low tide. Arrange a fishing trip on one of the many charter boats or just watch them bring in their catch. And don't miss the sunset on Cape Cod Bay-WOW! My family and I had the most perfect vacation in your home. We know the area since we used to live on Bakers Pond. We moved to Florida but our heart is in Orleans. And we still have family there. 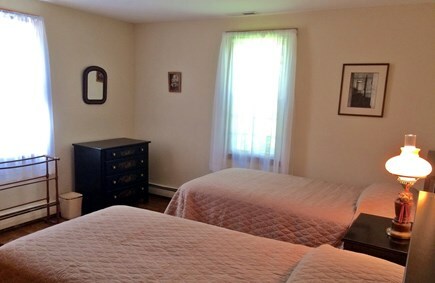 The home is very well equipped, clean, quiet and large rooms. Perfect perfect perfect. Thank you. Your home is now part of our memories. My parents, Howard and Jeannie, were born and raised in Milwaukee WI. They started coming to the Cape more than sixty-five years ago, to visit my mother's sister who married a Cape Cod native. 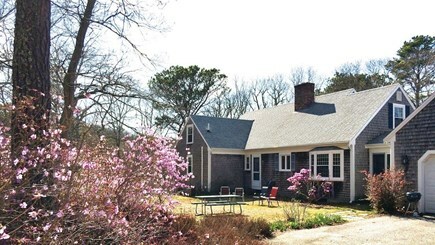 In the 1950's they knew they wanted to retire to the Cape and purchased their land in the 1960's. In 1978 my parents realized their retirement dream by building this house. Baker's Pond Road and Hinkle Lane, at that time, were dirt roads. There was only one other house on this side of the pond and no utilities, so a gasoline generator was necessary for any house to have electricity. When my father built this house he contracted with the town to have electricity brought in, which was the major reason for the further development of the area. Eventually, the roads were paved and town water was plumbed into the area. Our family have wonderful memories of this house, so when my parents passed we decided to keep the house and open it up to others to enjoy. The saying goes..''Location, location, location''. This house gives you the best of what the Cape has to offer. Whether it's a small fresh water pond, Nauset Beach with big waves, Cape Cod Bay where you can walk out a mile at low tide and the sunsets are incredible. 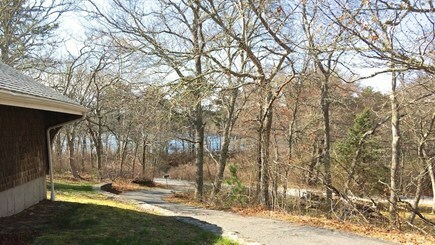 Plus there are close-by hiking and biking trails and the Cape Cod National Seashore. 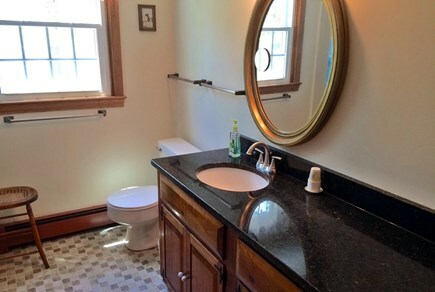 It's a lovely, family-friendly house in a really perfect location.